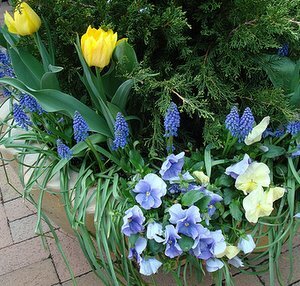 Pansy Flowers will cheer up your containers in early spring and summer. 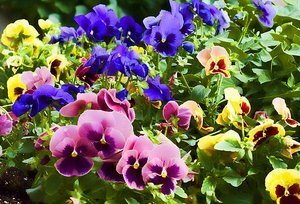 Planting and growing pansies in containers and flower beds is easy and can be done by absolute beginner gardeners. Pansies are I guess one the most popular bedding plants for containers and flower beds. There are good reasons for their popularity. They are available in a huge variety and many different colors and sizes. These cheerful little plants come in many colors from white, yellow, orange to blue, lilac and nearly black. The modern types of pansies are usually Viola wittrockiana hybrids and plant breeders have produced an amazing variety of colors and shapes. Pansy plants are easy to grow and are suitable for nearly every garden once you provide them with a sunny spot and a humus rich soil that is not too dry. You can either buy them already started in small pots or multi-packs. 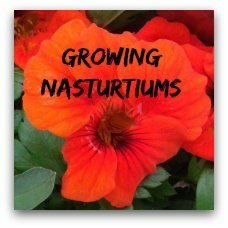 This is of course the easiest way to grow them. You can decide and see what colors you like best when you pick them out at your local garden center. If you need larger quantities of plants it is much cheaper to start them off from seeds. You can either buy pansy seeds online or get them at your local store. These bedding plants like a humus rich, slightly acid garden soil. The spot you choose for them should be sunny and ideally sheltered from wind so their big flower heads don't get destroyed. Start off pansy seeds in seed trays with a seed compost. Make sure that the seeds are not too close to each other. If the seedlings end up too close to each other they can start bolting and they get weak. Prick out (transplant) the seedling into small containers once they are big enough to handle. Don' forget to use a weak liquid fertilizer once they have rooted well. After about six weeks the plants should be ready for planting out. 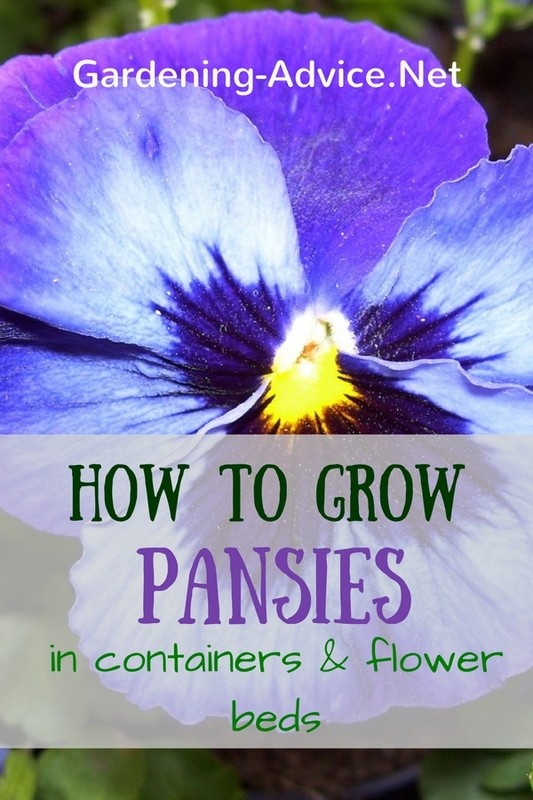 Depending on when you want your pansy flowers you have to start the seeds! - For flowers in the spring put the seed down in the summer of the previous year. - Sow the seeds in the autumn and plant out in the spring for early summer flowers. - Sow seeds in the spring for summer flowers. 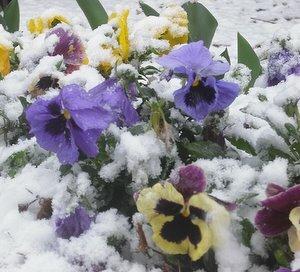 Winter flowering pansies are bred to be more frost tolerant and to flower very early in the year. 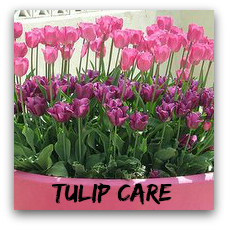 They are great in containers or flower beds. 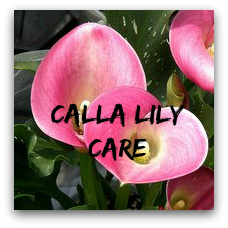 They do a great job for filling gaps and cheering up the place when flowers are scarce! Great companion plants for winter pansies are spring flowering bulbs. Particularly dwarf daffodils or tulips work very well with them. Important is to feed them when the ground is not frozen. That will keep them blooming for a longer period. Avoid letting the ground or compost go very dry. Keep them well watered. To prolong the flowering season dead-heading is very important. Just pinch out the flower with the stem at the base to avoid that the plant sets seeds. 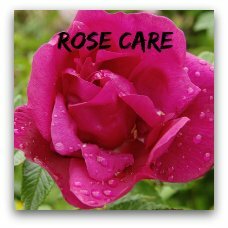 Use a fertilizer every two weeks to keep the plants vigorous and flowering. Autumn planting is only possible in mild climates with little frost. Waiting for the spring is more successful if you live in cold areas. More interesting pages for you..